This week’s recipe is a special request for little Thomas W. This little guy has been doing CrossFit Kids and personal training with us for a few months and he is getting stronger and healthier every day. He has also been learning about healthy food choices. So, when I asked him what I should post for my recipe of the week, he said a healthy pizza. So here you go Thomas! The really good part is that you can add your own toppings and change it up as much as you want. Try roasted brussels sprout leaves, feta cheese, artichoke hearts, tomatoes, pesto sauce and anything else that sounds delightful to you. Go easy on the cheese and load up on veggies to make it healthier. For this recipe and more recipes like this one, check out Paleoleap.com. If the Paleo movement has a right to brag about any culinary achievement, that achievement has got to be the grain-free pizza. We’ve got vegetable crusts of various types. 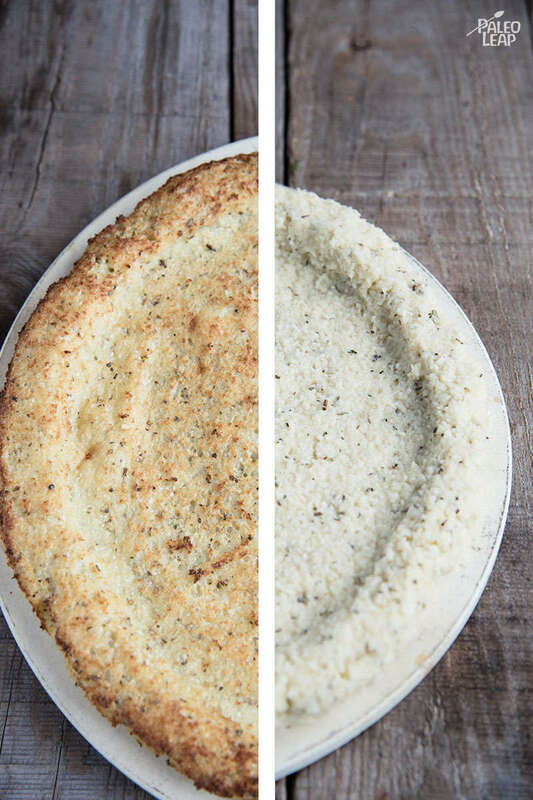 Protein-rich chicken “crusts.” Tapioca-flour crusts. Mini-pizzas in pepperoni “crusts.” Various other forms of grain-free delights. If “replacing pizza crust” were an art form, this probably would be the Renaissance. 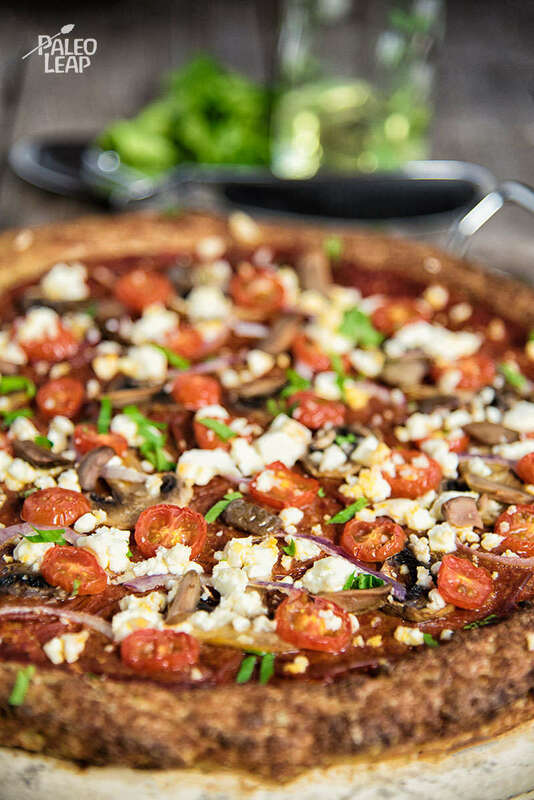 Here’s one more for the list: the classic cauliflower crust. Just to get one thing out of the way: no, not everyone likes cauliflower. If you hate it, check out one of the other options above. But plenty of people do actually like cauliflower as a crust for their Paleo baking adventures, so here’s a recipe for them. The cauliflower crust is a nice balance between taste re-creation and nutritional value. It’s vegetable-heavy, but it looks and tastes a little more “normal” than most other styles of vegetable crust. To make this one easy, you can make use of a great new convenience food: pre-shredded cauliflower. Yep, it’s a thing; you can get it at Trader Joe’s and you might luck out with some other grocery stores, too, since the Trader Joe’s product got really popular really fast. Or go the old-fashioned way and food-process your own cauliflower into submission, and then load it down with whatever toppings you feel like and pizza night is on! SERVES: 4 PREP: 25 min. COOK: 35 min. Place the cauliflower in a food processor and pulse until finely shredded (you may want to do this in different batches). Steam the shredded cauliflower for 3 to 4 minutes. Drain well, let cool, and strain any excess water using a towel. In a bowl, combine the cauliflower, oregano, dried basil, garlic powder, almond flour, and season with salt and pepper to taste. Mix everything thoroughly. Transfer to a pizza pan or baking sheet and shape into a pizza crust shape. Bake in the preheated oven for 15 to 18 minutes. Spread pizza sauce on top of the crust. Add all your desired toppings and bake for another 8 to 10 minutes, or until toppings are nicely cooked.